Defunct Audio Manufacturers - Ran to Rc - audiotools.com. A gentleman based in Lubbock, Texas, USA that started manufacturing high end amplifiers under the White name in the 1980’s and later under the White Audio Labs brand after complaints from another Texas company that had been using the White brand for years. The WAL products were distributed mostly in Texas and surrounding areas and rare outside of the southern USA. The operation was successful enough for Mr White to form a company around the business called White Audio Labs Inc. in 1993. After White Audio Labs Inc. had gone out of business in 1996 Mr White again started making amplifiers himself, this time under the Llano Design Group brand but carried on making basically the same product line as WAL Inc. had been making. His amplifiers generated quite a lot of interest and some controversy in the 1990’s, on one hand since they were sold directly from the factory they were fairly keenly priced for high end amplifiers and the Llano branded amps where thus cheaper than the WAL branded amps had been and appear to have been considered something of an audiophile bargain amongst the Texan hi-fi fraternity, however on the other hand Mr White claimed that they operated in pure Class A across the operating range which made no technical sense and managed to alienate a number of potential customers. Mr White added a number of products to the Llano product line-up in around 2000, including a line of hybrid valve/transistor power amplifiers and a power conditioner though the latter appears to have been a short lived product, we have seen one in the flesh but cannot find it in any catalogue from the company. Mr White stopped making products in 2003 citing business and health problems but there had been persistent reports on the net for a couple of years before that about communication difficulties with the company. Spares & service : You can try contacting Mr White to see if there is any service available for the products he used to make, he is in the phonebook, however reports are not positive. A highly diversified UK based company that was originally started in the 1920’s by J. Arthur Rank as a religious film production company, later incorporated in 1933 as the British National Films Company, but started buying up film distributor, cinemas and studios later in the 30’s when he had problems getting his movies distributed due to aversion by the rest of the industry to the propagandistic nature of his films. Had by the 1960's taken over a number of audio companies including English operations such as Wharfedale Wireless Works and Leak in addition to a number of overseas operations including Heco in Germany, they had also entered the business sector with companies such as Rank Xerox. It is traditional to speak of Rank Org. companies like Wharfedale as nominally independent subsidiaries of Rank and you will usually see company histories treat the "Rank years" as just another period in their history, in reality things were a bit more complex with a number of products appearing under multiple brands and a number of companies being folded into other operations. The company originally took over the Wharfedale operation in 1958 and continued to grow that brand and distribution network, in 1974 most of Ranks loudspeaker production was moved to a new factory in Wharfedale's home town of Bradford and some older production facilities where closed at the same time, the company had by then become one of the largest loudspeaker manufacturer in the world, in 1977 they produced more than one million speakers and had pioneered technologies such as laser interferometry and the use of polymers in drivers alongside metal and ceramic domes in tweeters. The company is still around but is by now almost exclusively occupied in the entertainment sector, operating casinos, bingo halls and remote gaming & betting sites, which is something that would probably not bemuse puritan founder J. Arthur Rank. An ex-theatre manager & salesman based in New York, USA that started marketing rigid stands for the Quad ESL63 around 1986 that he sold under the Arcici brand, Mr Shab claims to have started selling Arcici branded racks in 1979, which is possible but it must have been low key since we have not been able to find any advertising or mention of this in the NY hi-fi press from that timeframe. These Quad stands did quite well in his native country due to good reviews in the press and being quite decently priced for a high end hi-fi accessory, this is despite a rather unspectacular build quality and some scepticism voiced by the community of Quad Electroacoustics fans due to the fact that by lifting it from the floor it reduced the bass generated by the speakers, however while the 63 had better bass response than the Quad ESL57 it was frankly a bit boomy so many decided to use it with a subwoofer, in that case the Arcici stand was a distinct improvement since there was less competition in the upper bass range and essentially allowed the use of the ESL63 and a sub without a crossover. The ESL63 stand sold well enough to prompt Mr Shab to introduce a stand specifically for the ESL57, the original ESL63 stand was retroactively named as Q-1 alongside a small price hike to USD 300 RRP and the new ESL57 stand got the name Q-2 and had the same list price. The company later introduced stands for electrostatic speakers from other companies such as Martin Logan and for other high end speakers such as the B&W 801 and B&W 801. At around 1990 the company started looking for new products and throughout the 90’s introduced a series of "component display systems", that's American for hi-fi racks and equipment platforms. These were offered in both isolating and rigid versions; the isolatin models all featuring some sort of an air cushion as a de-coupler. Mr Shab released what was to become his best known product in the latter half of the 1990’s in the form of a high end component stand called Suspense that had a novel way of decoupling the acrylic shelves from the aluminium frame. It uses “pneumatic springs” (air filled tubes basically) that go between the top of rack and a separate frame made out of steel rods that the shelves are fastened onto, the shelf frame is suspended from the top rather than sitting on some sort of isolator which is the usual practice with such designs. Individual shelves are then decoupled from each other by using Polynorbornene rubber pads. 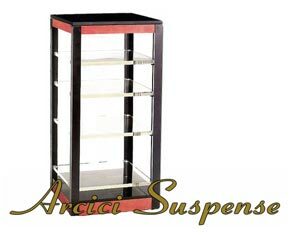 The Suspense rack got rave reviews in the USA audiophile press and sold well even though expensive and led the company to introduce a new “affordable” version of the Suspense racks that used MDF in instead of acrylic for shelf material and a cheaper frame, this was released in 2001 under the Grandstand name that and sold at half the price that the Suspense models was offered for. Sadly he started advertising them before they were ready, first few shipments turned out to have build quality problems and the line was eventually scrapped. Mr Shab also handled the distribution of SPJ turntable products in the USA for a while and for Asia as well for a few years. All contact with the company was lost in 2010, while it is not absolutely for certain that Mr. Shab is no longer supplying Arcici products, he has at the least been extremely difficult to get hold of, the contact details he has given out in the recent past are no longer applicable and punters trying to contact him to purchase spares for the Arcici suspension racks have had no luck in getting hold of him. There are a number of racks available in the channel that might be leftovers but there might also be that there is still a supply of Arcici products being made available on a smaller scale via distributors, what might have happened is simply speculation but it should be taken into consideration that when this was written in 2012 Mr. Shab was 80+, and he may simply have chosen or been forced to retire or decided to scale down the operation for obvious reasons. And a final note, Mr. Shab usually presented himself as Arcici Inc., or RCC Inc. (geddit? RCC in a nasal NY accent is arr sí sí or Arcici) but he never incorporated under either name but appears to have done business as a sole trader. Spares & service :No one seems to supply spares for the Arcici racks but that should not represent a problem, the metal frames can be worked on by any competent workshop (note though that some frames are aluminium, not steel), acrylic/plexiglass workshops can make replacement shelves, any Polynorbornene rubber can be cut into a replacement for the isolation pads and the tubes used as air cusions are basically wheelbarrow/wheelchair tubes that have been glued together using silicone glue, people have had no problem in getting such tubes from local hardware stores and some have even used bicyle tubes glued together as a replacement.